New to the game and was going over rules with some tiles/Minatures set up. Are there many instances where someone can shoot with line of sight to a target but also be hidden from target (target doesn't have line of sight back). I messed around with various positions but it seems difficult to have this scenario. Also, some thick black lines (walls) don't always finish at the edge of a square, but protrude a few millimetres into an adjacent sqaure...is this done on purpose to help with cover by reducing the number of corners an attacker can choose? The most common way to have LOS but your target not have it back is standing at the end of a wall and shooting at a target that is somewhere on the other side of the wall but also NOT at the end of the wall. You can draw two lines from your square where the corner meets the end of the wall to two corners of your target but your target can only draw lines to your one corner (note that the lines drawn can't be on top of each other). You can also do this if two figures stand diagonal to each other and you move to a space "between" them to make an L shape. You can then draw two lines originating from your corner to two of your target's corners but targets on the other side that are more than one space away can only draw to one of your corners (the one you drew two lines from). As for the wall artwork, the walls stop at the end of the space and do not extend into the next space. That small protrusion is graphical only and does not affect LOS. Note that Stormy #2 can shoot between his two friends but doesn't have LOS on JYN due to the wall. If she was 1 space to the left then #2 could shoot her but she could not shoot him as long as the other two troopers are blocking. For example cases (2) and (17) give non-reciprocal line of sight. Whatever the visual effect, the corners of walls do not extend beyond the corner of the space. Only the edges of spaces matter as said in (1). My target is surrounded by other figures, so the only place my Trooper can go is adjacent to them on a corner. Can I still attack them even though my trooper can technically only see one corner of the figure? Adjacent figures always have line of sight to each other. Note that you can draw line of sight through both the attacker and the target, so you can indeed draw two non-overlapping lines from one corner of the attacker to two adjacent corners of the target when the figures are adjacent. · Walls only block line of sight along an entire edge of a space. be traced to, from, and through that edge. positioned wall, blocking terrain, or other figure. 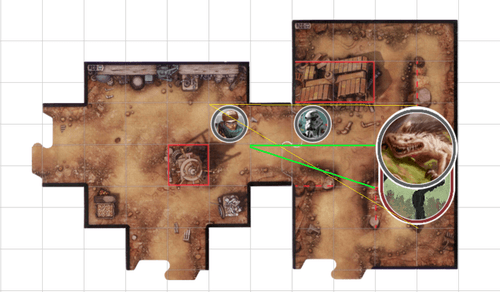 · Figures have line of sight to adjacent figures. · Adjacent figures always have line of sight to each other. Thanks for the fast answer! That’s what I remembered but couldn’t find the reference in the moment. Nice diagram. I have a question though. 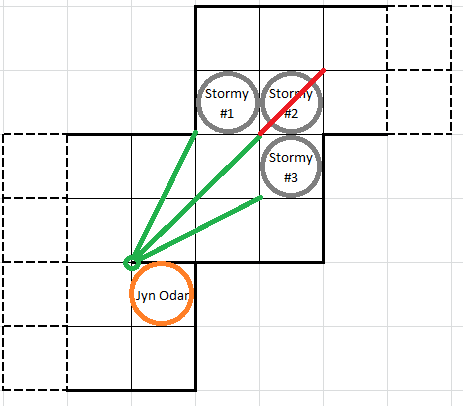 What is the accuracy that Jyn needs to hit Stormy#3? I think it's 3 but I recently heard I'm mistaken and it's 4 because Jyn needs 4 movement points to reach Stormy#3's space. Could you please help me out with the accuracy needed in these cases with wall corners? 4. The distance between Stormy #3 (or #2) and Jyn is 4. The distance to Stormy #1 is just 3. Counting Spaces ignores extra movement point costs though. Counting Spaces is a measure of distance, not using movement points. Note that the 2nd space on the other side of the wall is not adjacent to Jyn and that is why you cannot count it as one space away from Jyn. You can also count first to the west of Jyn, then 3 spaces to the Stormie #3. But that gives the same shortest distance of 4 spaces. Thank you for your swift replies. We have wrongly been doing that for a while. I'll let my colleagues know. Does a figure can LOS between 2 figures or one figure and wall or blocked line (between lines not corner) ? No. However, your examples do have LoS for another reason (not along the lines shown, though). If you were to replace the AT-ST with a Nexu, LoS could not be drawn in the same way. Note that you must draw LoS to a single space of the figure (the target space) and the two lines must be to adjacent corners of that space (not diagonally opposite). If one of your lines was going through the effective gap between another figure and the wall, any potential second line would either overlap the intervening figure, go through the wall, or the two lines would overlap, all of which would block LoS. • Figures do not block line of sight to or from a Massive figure. 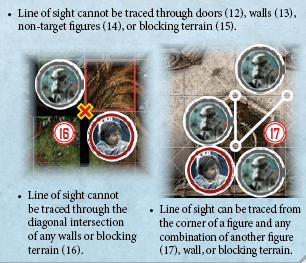 This rule allows you to essentially ignore the intervening figures if the target is the AT-ST. Note that you still must choose the target space as one of the spaces you can see and you use that space for accuracy and other purposes (such as resolving Blast). My Examples were very bad . I just want to know can a figure LOS between 2 figures or one figure and wall or blocked line (between lines not corner) or not ? RRG dose not say exactly about that . just said about corners . If one of your lines was going through the effective gap between another figure and the wall, any potential second line would either overlap the intervening figure, go through the wall, or the two lines would overlap, all of which would block LoS. For Los between 2 figures this you said is true but for wall or blocked line and one figure can have 2 Los lines to attack target . In effect the wall is between the spaces, so you are not drawing line of sight through the wall in this case. You cannot draw line of sight through an edge that has both a wall and a figure, as you would then be drawing line of sight through a figure (which isn't the target or the figure you are drawing line of sight from). I agree with Albert that the new examples can be simply explained by shifting the line of sight to the other side of the wall. If there were figures on both sides of that wall, then the second line of sight could never be drawn for the same reasons I mentioned earlier. I will slightly modify my earlier argument so that while the line between two figures or between a figure and a wall or blocking terrain might possibly be considered valid, such lines will either not have a second line, or you could draw the same line on the other side of the wall or blocking terrain and it would make more sense that way. In other words, the line may or may not be valid, but you might as well ignore it as there will always either be a better line or there will be no second line to complete Line of Sight. Having said that, there is one very obscure tile configuration that breaks my argument above. I don't feel it is worth highlighting what that would be as the situation is already frowned upon for other reasons and may very well be ruled out by errata due to that, so I don't feel it really counts as a contradiction. I'm not sure I agree with this statement on its own. Drawing along the edge of a figure is not drawing through it. Just like how you are not drawing through the wall on that edge, you would not be drawing through the figure that shares that edge either.